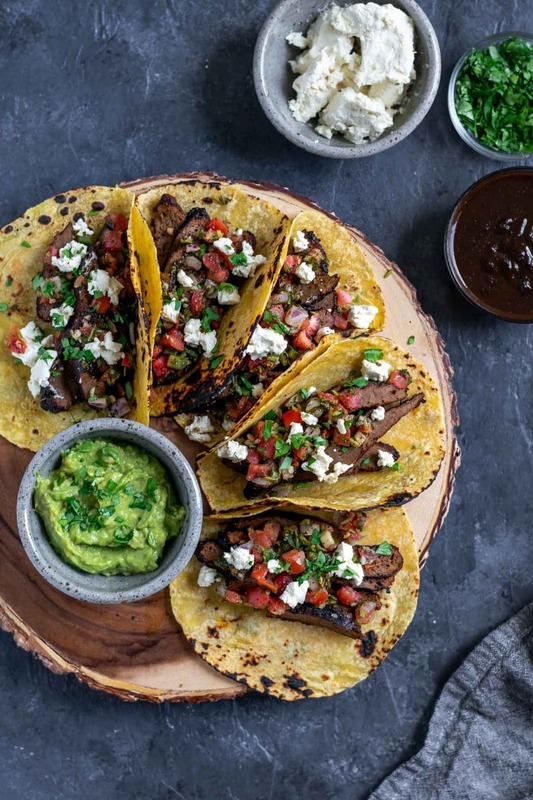 When the mood for flavorful, juicy seitan tacos hits, it’s reasonable to go to extreme lengths to satisfy those cravings. 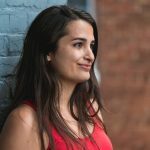 I thought about booking a flight to Chicago, LA, Austin, or Mexico City to get some tasty vegan Mexican food, but instead decided to develop a recipe (much less extreme)! And holy wow, I’m so glad I did. First, I needed the seitan. Juicy seitan, perfectly firm, chewy, and tender. So, I made some seitan steaks. Flavorful seitan stuffed with savory bold ingredients like tomato paste, soy sauce, vegan Worcestershire sauce, red wine. And don’t forget your usual aromatic suspects: onion and garlic, sautéed and blended for a subtle infusion of flavor. Adding black beans, chickpea flour, and some olive oil keeps the seitan from becoming too toothsomes. The seitan is best made in advance, as it chills in the fridge it firms up to the perfect texture. So maybe stop right here and go make the seitan! Then come back for the rest of these incredible vegan tacos 😛 . But ok, if you don’t want to make seitan at home, you can always use store bought. Usually prepared seitan is sold already cut up into chunks or slices, so you won’t be able to grill the marinated seitan. But you can always pan fry it! I think it’s worth the extra step of making the seitan steaks for this recipe. Once you have the seitan made, it’s time to make the marinade! Asada translates to grilled, so carne asada means grilled meat (beef/steak/cows). 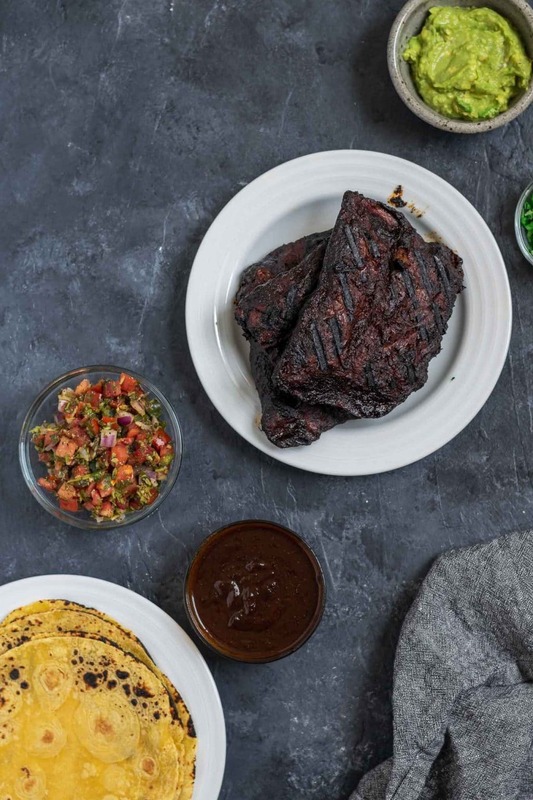 For carne asada, the meat is typically marinated in a chile-citrus sauce, but recipes vary. For my marinade I wanted some heat without being too spicy, so went for my go-to dried ancho chiles. Warmed until toasty and pliable, then seeds and stem removed, they bring such wonderful flavor to the marinade without much heat. For a second layer of chile I added a chipotle in adobo. I only added one (which seemed rather sacrilegious), so I left the seeds in, but you can always remove them for a milder marinade. Garlic and cilantro are the next two ingredients. I include the cilantro stems in the marinade. There is so much flavor in the stems, and as the whole thing gets blended smooth, you might as well use them! Next we have the citrus, which seems to be a main ingredient across all asada recipes I came across. I wanted a mix of sweet orange juice and tart lime juice, so squeezed some of the fresh juice from both fruits into the blender. Add some olive oil for richness, apple cider vinegar for tang, soy sauce for salty savory flavor, and brown sugar for sweetness to balance. Fragrant and earthy cumin, salt, and black pepper finish the marinade off before its blended into a smooth and thick sauce. Next we douse the seitan steaks in the marinade and let them chill for at least a couple of hours before firing up the grill. Or grill pan. Or just a regular skillet. Whatever you have, really! Seitan, thickly coated with the spicy, flavorful marinade is seared over the heat then thinly sliced to serve. It makes the juiciest, tastiest vegan meat. Stuffed into warm corn tortillas (I love heating them up directly over the flame of my gas stove) and topped with pico de gallo, homemade vegan queso fresco (ya’ll know I’m obsessed–to the point where I’ll say ya’ll apparently), and a little extra cilantro for good measure. These tacos are mouth-watering, insanely delicious, a sure-fire favorite. Luckily the recipe makes a pound of grilled seitan asada and many, many tacos (well like, a dozen or so). 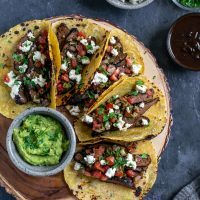 There’s enough marinade for 1 – 1.33 lbs of seitan (that’s 3-4 of the steaks from my seitan steak recipe), but you can double the marinade and make seitan carne asada for a crowd! 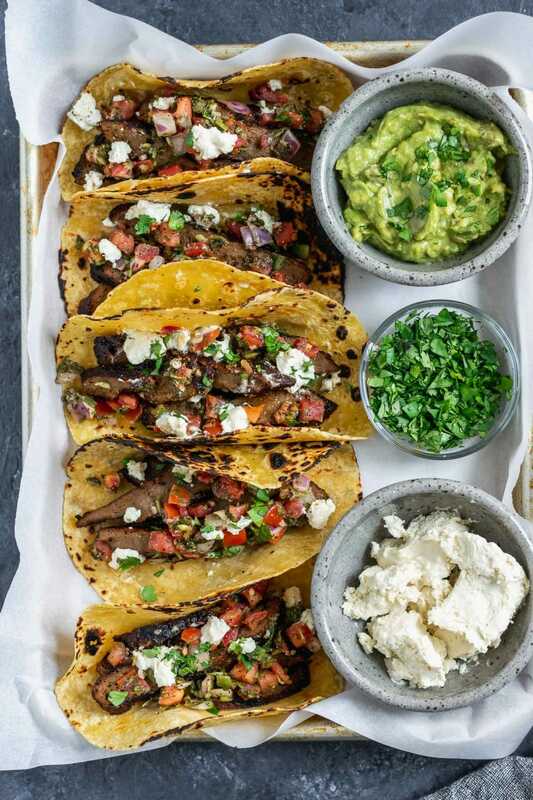 These tacos are the most delicious things I have made in awhile, and even though there are a couple other recipes to get to this point (namely the seitan steaks and the queso fresco), they are SO worth it. I really hope you guys try them! If you make this dish, leave a comment and rate the recipe below! And as always, don’t forget to tag your recreations @thecuriouschickpea and #thecuriouschickpea on Instagram! If you’re making the homemade seitan steaks, once they’re cool enough to handle, you could stick them in the marinade and refrigerate the whole thing together overnight. The seitan will firm up as it marinades, cutting out that extra step! For a gluten free asada, substitute soy curls. Reconstitute the soy curls in boiling hot water until plump and soft, then squeeze out the water from the hydrated soy curls before marinading. Pan-fry the marinated soy curls, as you won’t be able to grill them. Seitan is marinated in a spicy and tangy sauce then seared over a grill (or grill pan) until charred. 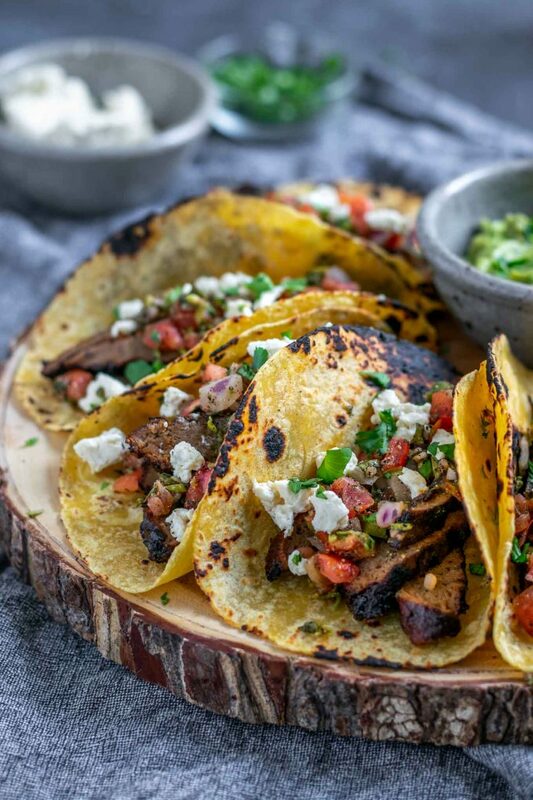 The juicy seared seitan carne asada is thinly sliced then piled into warm corn tortillas and topped with pico de gallo, vegan queso fresco, and minced cilantro to serve. It makes for the most delicious and flavorful vegan tacos! Toast the ancho chiles on a dry skillet over low heat until supple, about 5 minutes, or microwave in 30 second increments until softened. Remove seeds and stem, roughly chop, and add the chiles to a blender. Add the chipotle in adobo, garlic, cilantro, orange juice, lime juice, olive oil, apple cider vinegar, soy sauce, brown sugar, cumin, salt, and black pepper to the blender. Blend until thick and smooth. Taste and add more salt if desired. Place the seitan steaks in a quart sized ziplock bag and smother with all of the marinade sauce, making sure that the sauce gets in between the steaks and fully coats each one. Seal the ziplock bags and place in the fridge for at least 2 hours, but ideally overnight. Thinly slice the grilled seitan carne asada and set aside, covered to keep warm. Heat the corn tortillas, either over the gas flame (for charring) or on a dry skillet, and wrap in a cloth or a tortilla warmer to keep warm. 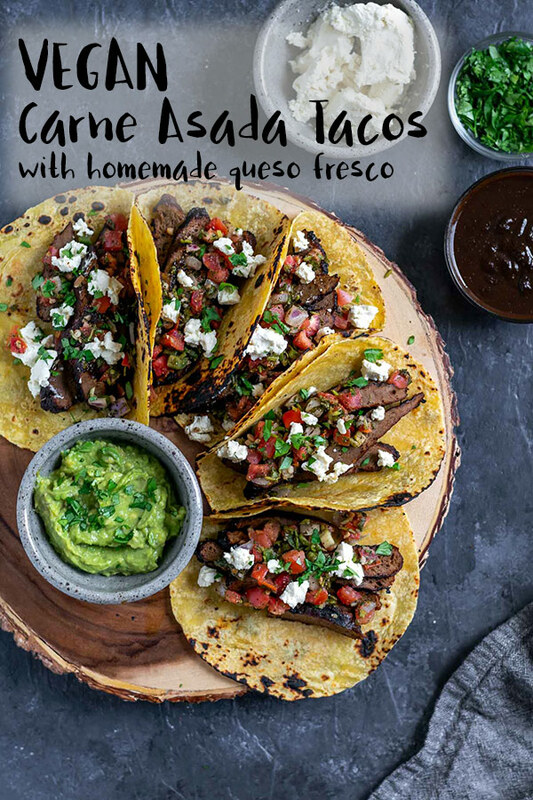 To assemble the tacos place the sliced seitan asada in a warm tortilla and top with pico de gallo and crumbled queso fresco. Sprinkle on a little extra cilantro and serve with extra thinned mojo sauce if desired. Enjoy! Prep time does not include the time for marinating. Add at least 2 hours, but for best results marinade overnight. These look perfect! Can’t wait to make them. Was perfect for the Memorial Day cookout I went to. This was the best seitan recipe I’ve ever used because the meat had a great texture. My queso fresca was more creamy than crumbly. Will have to figure out where best to cut liquid content. It was delicious though and worth the prep work! Thanks. I’m so happy to hear this David!! As for the queso fresco, it might have just been a bit warm, the coconut oil is what gives it the creamy but crumbly texture, and is so temperature sensitive. Otherwise it depends on the water content of your tofu. You can always press the tofu to extract some of the water before blending! Thanks for reporting back!